Ever heard of a lunchbox that keeps your food warm for up to 6 hours? Me too until I was introduced to a brand called Vaya. Vaya’s range of Tyffyn and Drynk is built with a clever temperature management system that maintains the heat of your packed lunch or keeps the coolness of your favourite drinks – allowing you to enjoy your food or beverages exactly hot or cold. Lovely isn’t it? Tyffyn is so sleek and fashionable. I just love the colours! This highly sophisticated lunchbox comes with a convenient collapsible handle which tucks away neatly. Built with VacuTherm™ insulation – this precision engineered technology is what keeps your food warm inside. Tyffyn comes with 2, 3 or 4 container variations, perfect for children to bring to school (2 containers) or for your hungry husbands (4 containers). Also called Jumbo, the 4 container Tyffyn makes a great travel buddy for sharing meals for two, likewise. This high-end lunchbox is leak resistant and the lids are BPA-free. There are partitions inside the containers, allowing you to carry more than one dish at go. You can either choose the copper finished or polished stainless steel. Additionally, this goes great with Bagmat – a stylish shoulder bag which converts into neat table mat for your lunch. Similarly, these bags are fabricated to improve the heat retention efficiency of all lunchboxes. Besides keeping food warm, Tyffyn also works ‘on the contrary’ by keeping food cold for up to 6 hours. I have seen reviews of people mentioning their salads and fruits are kept fresh and cool in their Tyffyn, to be enjoyed after a yoga class. Like the Tyffyn, Drynk works the same by keeping beverages hot for 12 hours and cold for 18 hours. Drynk tumblers has a magnetic cover, making it easy to drink while you are on the road for instance. 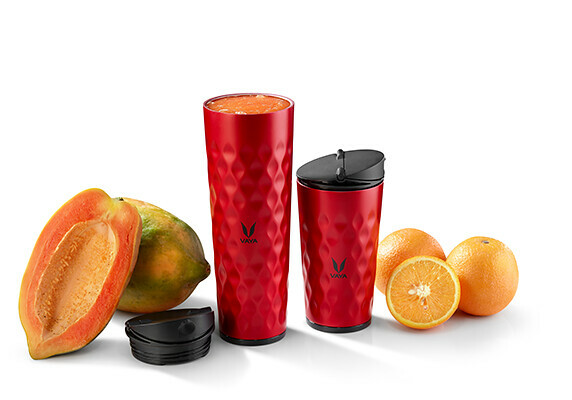 The base is anti-slip and each tumbler comes with a sipper and gulper lid, along with 2 cups. Based on my personal experience, I feel that Drynk is very handy and convenient. Imagine going on a road trip and your coffee is kept hot even after 10 hours (yes, believe it!). Or perhaps homemade juice or mum’s cold soya bean. It stays cold even when it is scorching hot outside. It is just amazing! Loving it! The latest thing to hit the market is Vaya Preserve – a food storage jar doubling as an on-the-go meal carrier. Preserve keeps ingredients fresh, hot or cold, all at the same time. It is the same VacuTherm™ Technology that ensures food remains hot or cold, and most importantly fresh for up to a good 6 hours. Preserve works the same as Tyffyn but with an added convenience of easy portability. It fits snugly into a handbag or satchel. Preserve is great for one-pot meals yet handy to carry in a bag. Vaya’s range of products are FDA approved and compliant with the most current European standards. There are good discounts on some days, especially during weekends. Hope you enjoy your Vaya as much as I do!